Ideal for anyone wanting great looking and feeling legs, especially those who sit or stand for long periods of time. Prevents mild leg fatigue and discomfort and ankle and foot swelling by improving circulation in the legs. Helps prevent varicose veins and spider veins. Elegant in its sheerness, this support hose gives comfortable, ultra-light support while still remaining fashionable. Feels and looks silky smooth. 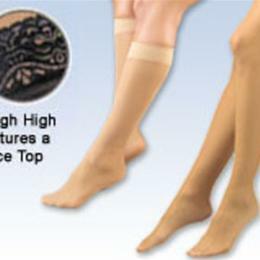 Support Pantyhose (H11) features a lightweight control top and sheer sandal foot. Thigh High (H12) features a lace top with silicone strips to keep the hose in place. Knee High (H13) features a comfortable top band and sheer toe. Nylon/Spandex.